Dubbed the Jon Stewart of the Arab World, was the host of popular TV show AlBernameg – which was the first of its kind, a political satire show in the Middle East. Originally a 5-minute show on YouTube, AlBernameg became the first online to TV conversion in the Middle East and the most watched show across the region with 30 million viewers every week. AlBernameg received wide acclaim around the world with coverage in some of the biggest media outlets, topping it off with Youssef’s appearance on the Daily Show with Jon Stewart twice in June 2012 and April 2013. In June 2013, Youssef hosted Jon Stewart on AlBernameg in Cairo marking the second season’s peak. Al Bernameg was chosen by South by Southwest, one of the largest international interactive festivals, as the first and most successful internet to TV conversion story in the Middle East. Al Bernameg’s YouTube channel was the first channel in the MENA region to reach one million subscribers. Throughout its three seasons AlBernameg remained controversial through its humorous yet bold criticism of the region’s ruling powers, which led to multiple lawsuits being filed against the show and its host. Youssef was even issued an arrest warrant in March 2013 and turned himself in the next day where he was questioned and later released on bail. In recognition of his success, Youssef was named among the Time Magazine most influential list for 2013 – under the “Pioneers” category, was awarded the International Press Freedom Award by the CPJ, and was chosen by Foreign Policy magazine as one of the global thinkers during the same year. In the spring of 2015 Youssef served as a resident fellow at the Institute of Politics at the John F Kennedy School of Government. During his stay in the US he appeared twice as a Senior Middle East Correspondent on the Daily Show with Jon Stewart, commenting on the recent political situation in the region. In 2015 he hosted the International Emmy Awards gala of 2015, as well as the 49th Carthage Film Festival in Tunis. Youssef has also hosted a digital series titled “The Democracy Handbook” for Fusion Network, for its new digital platform F-Comedy. He is also the star of an internationally renowned documentary by Sara Taksler titled “Tickling Giants” featuring Youssef’s story with AlBernameg. Youssef has recently released a book about his experience Revolution for Dummies: Laughing Through the Arab Spring, where he gives different perspectives and insights on the Egyptian political scene through the Arab spring and after. It was announced in October 2017 that Bassem Youssef would be doing the voice over for for Disney’s Duck Tales as “Sabaf,” the evil guard of an all mummified pharaoh. 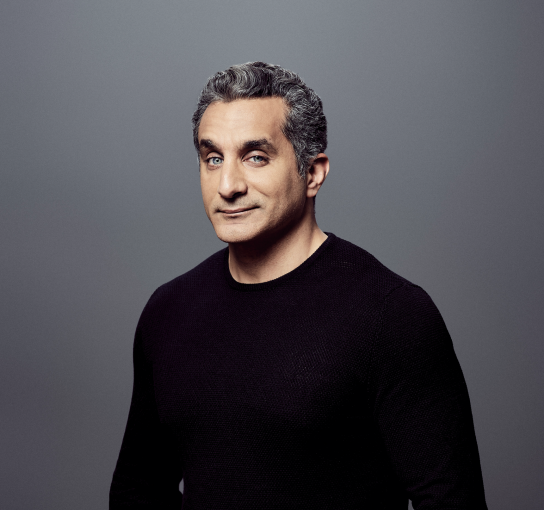 In that same month, ABC network announced that Bassem Youssef would be teaming up with Larry Wilmore, for a super hero Middle Eastern American family comedy. The show centers on the Sharif family, an ordinary Middle Eastern American family with two superhero parents at a time when it’s illegal to be a superhero, so they are forced to save the world in secret. On April 26th, 2018 it was announced at a sold out taping of Stay Tuned with Preet at the Apollo Theater, that Bassem would release his own podcast entitled ReMade in America, where Bassem and a fellow outsider sit down for an honest, intimate conversation about topics they hold near and dear, exploring how many of the rituals and practices we take for granted in America are done differently abroad. Youssef majored in cardiothoracic surgery, passed the United States Medical License Exam (USMLE) and is a member of the Royal College of Surgeons (MRCS). Having practiced cardiothoracic surgery in Egypt for a period of 13 years, before moving into comedy and political satirism.